These are common spiders. They can grow quite large. Eyes are arranged in 3 row - the pair in the second row are largest. The cephalothorax bears dark vertical strips, which are characteristic of the family. Agelenopsis (Grass Spiders) have similar markings. Eyes: 8 Dark eyes of unequal size arranged in three rows: Top row with a pair of large, forward-facing eyes, and a pair of large lateral eyes; and a bottom row of 4 front eyes of similar size and shape. Abdomen and cephalothorax: As long as wide. Legs: Long with three microscopic claws at each tip. About 240 species in 21 genera in America north of Mexico. Exact numbers and recognized genera are subject to change. Preferred habitat varies between species but includes open grasslands, suburban lawns, deciduous forests, deserts, coastal dunes, sandy soil and the wet terrain of marshes and swamps. Most live on the ground and hunt for prey at night. Dark mottled colors help camouflage spiders among the leaves. Except for those in the genus Sosippus, wolf spiders do not spin webs. Some dig burrows in the ground, others make holes under rocks, and many have no retreat at all. Throughout North America. Widespread from the Arctic to the Subtropics. Males courts potential mates by rhythmically waving pedipalpi. 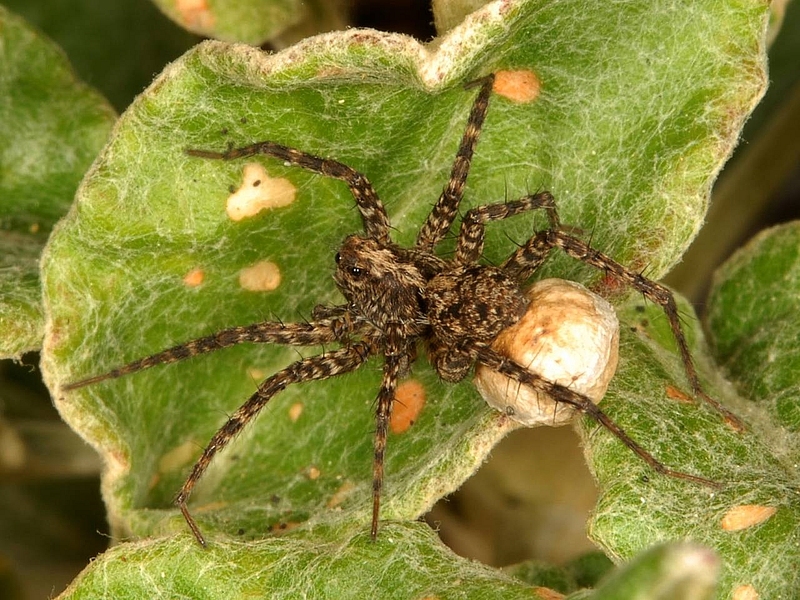 Females spin a spherical egg sac, attach it to spinnerets, and carry it until spiderlings emerge. Spiderlings clamber about on the female's back and are carried until they disperse. Family Lycosidae - Wolf Spiders. (http://bugguide.net/node/view/1967). Accessed March 12, 2016. .